KAMPONG THOM Province, Cambodia, October 2018 – In an era of abundant data, education professionals in Kampong Thom province have been taught to collect, process and use data on student academic performance and attendance to inform their lesson plans and to improve the school. Funding from a multi-agency partnership known as the Capacity Development Partnership Fund (CDPF) has made it possible for education professionals in one of Cambodia’s poorest provinces to receive training in statistics and data analysis. Led by the Ministry of Education, Youth and Sport (MoEYS) with support from the European Union (EU), the Swedish International Development Agency (SIDA), the Global Partnership for Education (GPE), the United States Agency for International Development (USAID) and UNICEF, CDPF aims to strengthen the capacity of school administrators and teachers to better deliver quality education to children in Cambodia. The activities under this programme are implemented in collaboration with non-governmental organizations such as Volunteer Services Overseas. The new skills related to statistics and data analysis may seem basic at first glance; however, for the children who attend Kampong Thmar Primary School, it has made a world of difference. By accurately collecting and analyzing education data, teachers can now develop lesson plans and school programmes that can help them to better respond to the specific needs and challenges their students face. With these new skills, it is expected at the end of the school year, more pupils would have enrolled in or attended school and achieved better grades. CDPF’s data collection and data analysis trainings were conducted to complement the government’s efforts in encouraging school administrators and staff to correctly use its education management systems that collects education data from schools across the country. The data is used to better plan and deliver education to children. To ensure that these systems are effective, school directors in Kampong Thom province attend statistics and data analysis workshops held by the District Office of Education, before holding professional development sessions of their own with the staff at their respective schools. Ms. Kong Sreymao, a Grade 5 teacher who has taught at the school for 31 years took the training. She explained how it completely transformed her teaching methods. Today, with the knowledge from the training guiding their work, the teachers work closely with the school director to improve the school’s performance by comparing data from different years and months to track their progress and update their education delivery plans and school operating guidelines. 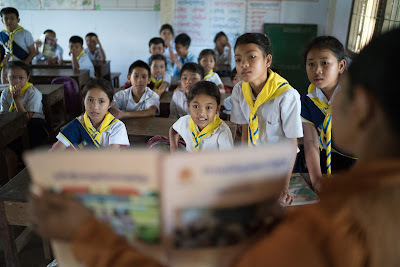 Collecting and tracking education data also helps the staff of Kampong Thmar Primary School to identify and address pressing issues in the community that may prevent some children from attending school regularly or enrolling at all. Information gathered over the years has been used in the school’s education plans, which has set priorities for improving the school’s environment, improving the accessibility of education for local villagers, and increasing the quality of teaching and learning materials. “I see now that our students are more capable when it comes to learning, and those who cannot catch-up can receive the specific support they need. Parents are also more understanding because we use the data to explain why their children are performing well or poorly,” she says. To this day, Ms. Sreymao periodically attends education management workshops, which are held multiple times in a year by her school director. She emphasizes the importance of these sessions by speaking about the changes she has seen at her school since her first training five years ago.